Taiwanese people are proud of the way they have preserved traditional Chinese culture. But short-term visitors might wonder if that's little more than boasting. After all, you don't see people playing Chinese instruments like the two-stringed erhu or the bamboo flute or writing beautiful calligraphy with brushes dipped in water, like you do in Beijing. In Taiwan, it's more common to see people drinking bottled tea rather than the traditional way - loose leaves steeped in a porcelain cup. Tea served in tiny clay or porcelain teapots is called "old people's tea" here. The classical courtyard mansions and other ancient buildings are much more common in China's capital than Taiwan's capital. So other than the 650,000 pieces of Chinese treasures brought over from China and stored at Taipei's National Palace Museum, where is the traditional Chinese culture in Taiwan? But visitors who stay a little longer will see that centuries-old religious and cultural festivals that have died out on the mainland are still celebrated by millions of Taiwanese. These include the annual Mazu pilgrimage to honour the Goddess of the Sea. She was worshipped a millennium ago by fishermen in southeastern China, but the Communists banned the practice during the Cultural Revolution. Chinese immigrants brought belief in her to Taiwan in the 17th Century. Statues of her are widely seen in homes and businesses here. There's also the Burning of Wang Yeh's Boat Festival. Wang Yeh is a plague god worshipped in the old days when mystery illnesses struck communities. During the festival still celebrated in Taiwan, his statue is taken on a days-long parade through towns where he collects people's illnesses and problems. The festival ends in an all-night party where Wang Yeh is feasted, entertained with music and his boat loaded with fake paper money. The vessel is then set on fire on the beach to symbolise sending him and the people's problems out to sea. Every September on the birthday of the great sage Confucius, elaborate ceremonies are carefully staged in Taiwan. The one at Taipei's Confucius Temple is attended by the president - something you wouldn't see in China. Besides festivals, auspicious days on the lunar calendar are also popular, with fake paper money burned on the sidewalks to pay for protection from the gods. And the cultures of Taiwan's Min Nan and Hakka ethnic groups - though derived from China - are followed here in a way that seems more Taiwanese than Chinese, as these groups' identities are not celebrated on the mainland. Many of the cultural traditions Taiwan has preserved are related to ancient Chinese music. These include performances of "yayue" or ancient Chinese court music, some 3,000 years old. It died out in China, but was painstakingly researched and revived by professor Chou Chun-yi at Taiwan's Nanhua University. And while it would be hard to find the gentle and melodic sounds of Nanguan music in China's Fujian province, where it originated, it is still occasionally performed in Taiwan. Some Taiwanese have also re-created Tang Dynasty dances from 1,300 years ago, though performances are rare. The problem is even these treasured traditions are not widely accessible in Taiwan, a society more interested in the trendy and modern. Taiwan's efforts to keep Chinese culture alive have impressed many. Some Taiwanese, however, have tried to avoid linking their cultural traditions with China, despite their Chinese roots. There are people, for example, opposed to the mandatory teaching of Confucius texts in schools, favouring building Taiwanese identity instead. Ironically, Confucius' ideals are perhaps more widely taught and practiced here than anywhere else. The influence of Confucianism can be found in the behaviour of Taiwanese people, known for their friendliness and politeness, and in the settlements of its earliest Chinese immigrants. "Chinese culture is the basis of Taiwanese culture, but because of politics, some people try to deny this. We shouldn't deny our cultural history," said Emile Sheng, minister for the Council for Cultural Affairs, the government department which promotes Taiwan's culture. Mr Sheng says Taiwanese culture, despite its roots in China, has developed in a uniquely Taiwanese way. "We have influences from Holland, Portugal, Japan, and the United States, but Chinese culture is indeed our foundation," Mr Sheng says. "Taiwan's culture is diverse, innovative and accepting. It is different from China's culture." For example, he says, the island has maintained the use of traditional Chinese writing, while China switched to simplified characters. And its calligraphers have also developed new styles. Some scholars say Taiwan should become more like Japan South Korea or Vietnam - all countries heavily influenced by Chinese culture in the past, but which developed their own culture. But Mr Sheng believes that's unrealistic. "Should we then say our culture is not Chinese culture? Then what is Taiwanese culture? 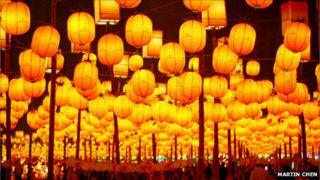 Our language, writing system, festivals and celebrations are all Chinese. How can Taiwan become like South Korea or Japan?" Taiwan's indigenous culture sets it apart from China, but it's only one part of Taiwan's identity, he adds. Ultimately, what many Taiwanese people cite as the most unique aspect about Taiwan, compared to China, is its democracy. "Culture is not based on military power or population size," Mr Sheng says. "Chinese tourists who visit Taiwan really like Taiwan's culture, its openness, and politeness. They see the differences." He believes it's impossible for Taiwan to become identical to China, despite the stepped-up exchanges. Taiwan might ultimately influence China more. Already, Taiwan's pop culture is one of its biggest exports to the mainland and ex-pat Chinese communities. Long before relations improved, Chinese people loved Taiwanese singers, like Teresa Teng in the 1970s and 80s. Nowadays, many songs popular in China are from Taiwan. "Our cultural influence is really great. We should be confident in our culture," said Mr Sheng. With improved relations with China, Taiwan has recently begun spreading its traditional Chinese culture back to the mainland as well. China's Fujian province, where the Goddess of the Sea was born, now seeks help from Taiwan to rebuild its Mazu temples and revive Mazu festivals. The China Conservatory of Music in Beijing and Chinese universities have set up their first yayue ensemble devoted to playing court music, and have invited Professor Chou to be their chief advisor. But Taiwan also faces challenges maintaining its own people's interest in traditional culture. Many young people cannot speak the language of their ethnicity. Glove puppetry used to be the main form of entertainment on the island before televisions or movie theatres, but nowadays it's hard to find children who have seen a puppet show. Puppet masters are struggling to attract fans. To win over a new audience, puppet masters have made TV puppet shows, and are planning to make 3D puppet movies. And they've added modern props such as motorcycles and computers. At a performance in a children's playhouse in Taipei, Steven Huang, a fourth generation puppet master, put on a show that held the entire audience's attention. The stars on stage were the typical martial arts heroes, but had cartoon faces and Sponge Bob joined them. To Mr Huang, puppetry must be preserved. "It's inseparable from what is Taiwanese," he says.